Do you have passion to reach out to the elderly in Potong Pasir? We need you! Pairs of volunteers will be assigned a senior to befriend through regular home visits, most of these seniors are less mobile and more prone to social isolation as they stay alone. Calvary Community Care is organising a fall prevention exercise for seniors, as well as a boardgame activity (Rummikub) that improves the mental wellness of our seniors. If you would like to make meaningful use of your time on a weekday morning, sign up today! All senior programmes and meeting points for ad-hoc events are located at Potong Pasir, unless briefed otherwise. 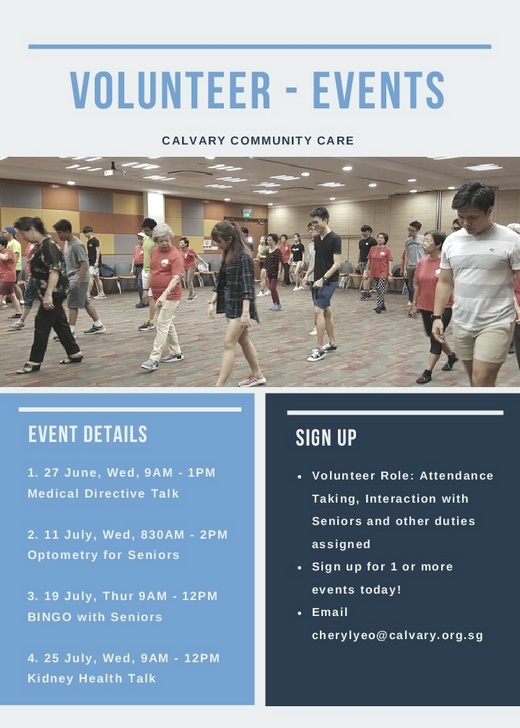 OR email Cheryl at cherylyeo@calvary.org.sg.